Abbott is working to bring meaningful innovation to Latin America, the third largest economy in the world. Did you know that the Latin American region has the third largest economy in the world by GDP with a healthcare expenditure comparable to that of China or India?1 Made up of dozens of countries, Latin America is home to 500 million residents. 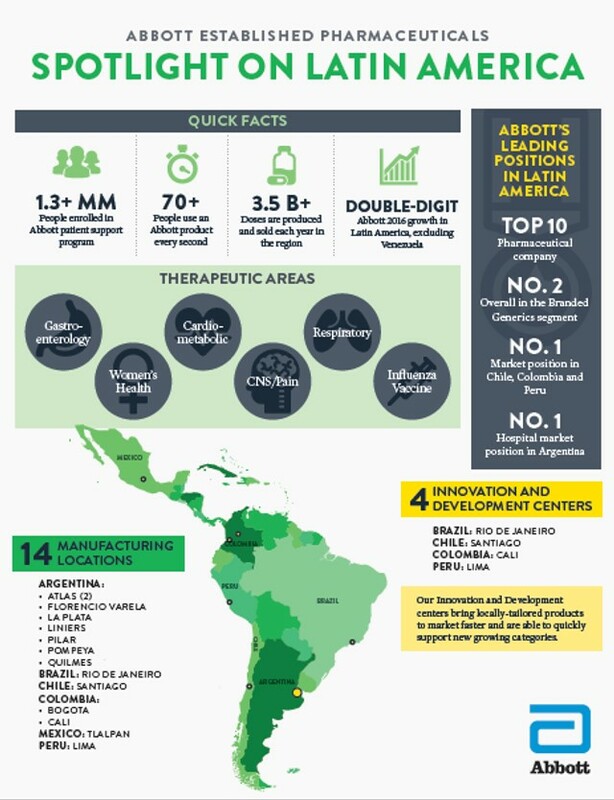 Abbott has a rich history in Latin America, specifically through its branded pharmaceuticals business. Our significant manufacturing, innovation and development presence throughout the region has allowed us to bring meaningful innovation to emerging markets to help people live healthier, fuller lives. Click to learn more. Abbott is the only multinational company whose pharmaceutical business is 100 percent focused on emerging markets. Abbott is a top-10 pharmaceutical company overall in Latin America, No. 2 in branded generics and has a significant manufacturing and development presence throughout the region. Abbott holds No. 1 positions in Chile, Colombia and Peru.